These stocks are proving to be healthy for investors' portfolios in 2018. While the big S&P 500 index is up all of 2.6% on a price basis year-to-date, the healthcare sector is up significantly more, with the popular Health Care Select Sector SPDR ETF (XLV - Get Report) up nearly 14% over the exact same time frame. One of the healthcare stocks that's been leading the pack higher this year is pharmaceutical giant Pfizer Inc. (PFE - Get Report) . Pfizer has been a much needed pocket of low-volatility outperformance for investors in recent months, a stretch when investors' risk tolerance has been tightening. The good news is that Pfizer's leadership status in this market environment isn't showing any signs of fatiguing - in fact, shares just pushed into breakout territory this week. At a glance, it's hard to miss the overall trend in shares of Pfizer. This stock has spent much of the last six months moving up and to the right in a well-defined uptrend. In October, when the rest of the broad market corrected sharply, Pfizer's dip was far more muted. And while that correction played out, Pfizer was setting up a pretty textbook example of an ascending triangle pattern, a bullish continuation setup that's been setting the stage for more upside ahead. The ascending triangle in Pfizer was formed by horizontal resistance up at the $45 level, with uptrending support to the downside. 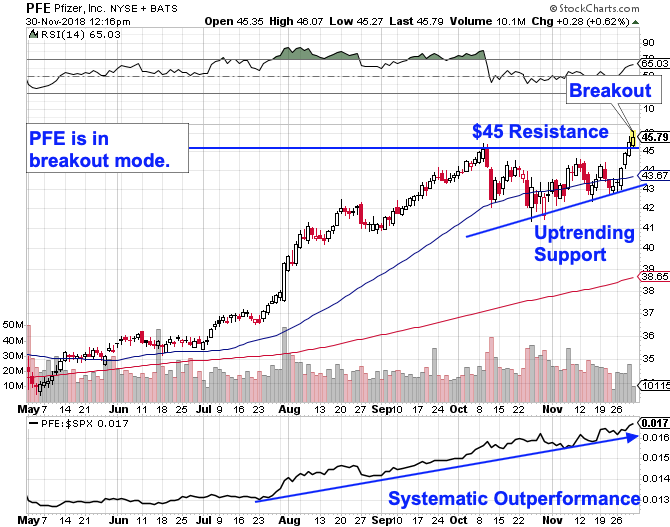 Put simply, as this stock bounced in between those price barriers during October and November, shares were setting up for a breakout through the $45 level; that's what we're seeing this week. Pfizer's breakout signals that buyers are definitively in control of shares this fall. That's confirmed by relative strength, which remains in a long-term uptrend of its own at the bottom of the Pfizer chart, indicating that this stock is systematically outperforming the rest of the broad market right now. Risk management remains important in the current environment; if Pfizer violates prior lows at $42, the breakout is busted and you don't want to own it any more. In the meantime, the high-probability trade for Pfizer looks like more upside ahead.